I got out Sunday and mowed the yard. A nice day, pretty out. And made a timelapse of it. The movie is too quick, but my yard is so small i should have just recorded it as a normal movie instead of a timelapse..then i could just speed up the framerate and be done. Then I proceeded to replace the shocks in the truck. I bought a little 98 Tacoma recently, as a daily beater, home depot hauler and to keep the miles off the RX-8. And maybe a little 4x4 action from time to time. I noticed that when driving 60+ MPH on the highway, if you hit even the slightest bump it dances around for a while....not very reassuring of your vehicle and probably not safe either. 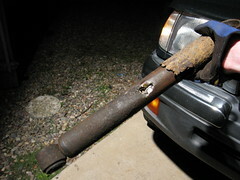 Further investigation showed that my shocks are shot. And one is blown so bad there is a hole in the side. Yike! So at the recommendation of Eddy, I bought some Bilstein's as a performance upgrade. They were about $300 total for all 4. The rears were the worst so I installed them first. And I made a neat little movie that is a 10 second how-to. Hope you can follow. The difference is amazing, no more wobbling on the higway and I only did the back shocks! Bumps are soo nice now! Highly recommended to you older Toyota owners.